You’re smart enough to fly a jet. You’re talented enough to create the Gold Digger universe. You’re dedicated and motivated enough to consistently deliver laugh-out-loud comedy, spine-tingling action & adventure, and offer up a body of work that is both visually & intellectually so detailed it rocks my world on a regular basis. You took 5 seconds out of your life to not only read my fan mail, but to publish it in the back of your 200th issue extravaganza. AND NOW, you’re somehow generous enough to GIVE your fans 199 FREE ISSUES to read at their leisure?!? You are my hero and my idol. 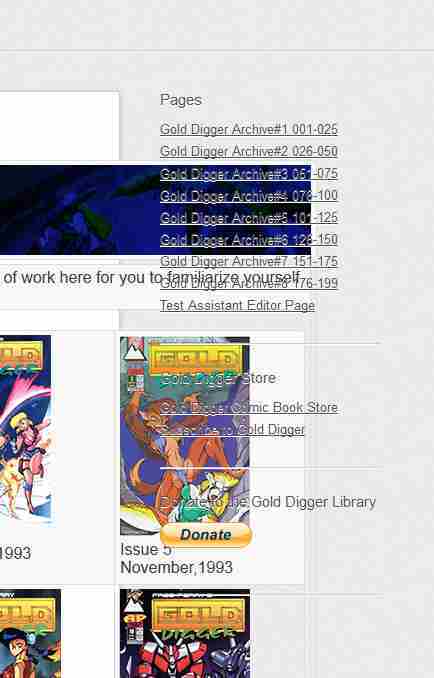 Hi, thought I’d pass along that your archive pages look a bit messed up in my browser. I’m seeing this in both Firefox and IE10 and I’ve white listed this site for both my adblocker and scriptblocker. The “Home” page looks fine. http://www.deviantart.com/art/Amazonies-378102160, who you’ve apparently traumatized with your last issue. Sorry, should have realized that first link wasn’t going to work, so I put it up here. Jesus, am I having a bad day, wrong link in my clipboard.